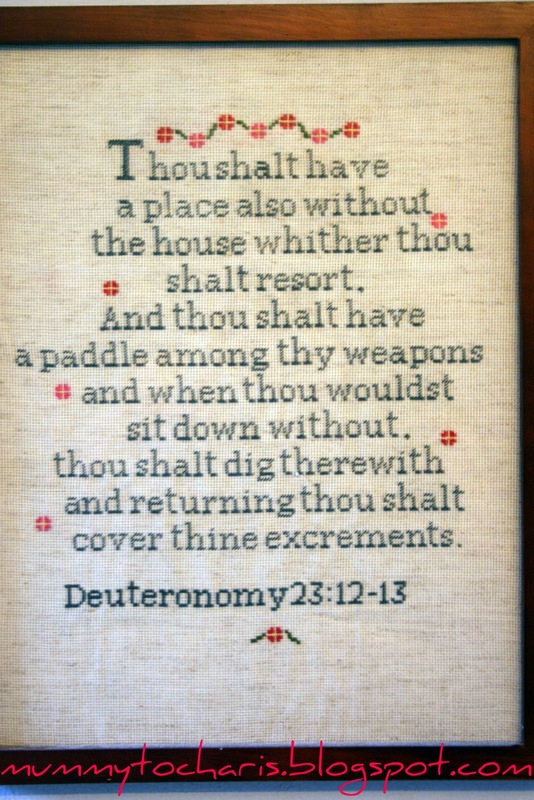 This cross stitch is hanging up in our bathroom. One of my best friends [Amy] gave it to us as a wedding present. The story behind it is: The year was 2004. We were getting ready for the Extravaganza, the Tri-Rhos semi-formal dance at Grove City College every February. 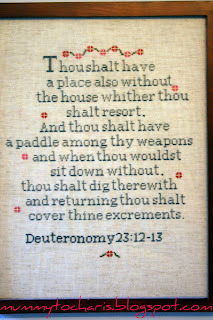 I was flipping through Deuteronomy looking for the Bible verses I had told Amy and Rachel I wanted on my bathroom wall when it came time to living out of my parents house. Finally I found it. Amy took a mental note and 5 1/2 years later gave me this as a gift. Thanks Amy!! Yes, it's DEFINITELY hanging up on the bathroom wall. Every time we have guests over, we take a "field trip" into the bathroom to show them this.